Use a light dressing that won’t fling off when it rains. Rubber Dub gives a dry touchable finish, can be left matt or buffed to a shine and repels water. It is suitable for tyres, under bonnet hoses, window rubbers, mud flaps, etc. Scholl Concepts Blue or Angelwax Elixir is multi-purpose, sprayable dressing and can be used on tyres, as well as exterior plastics and vinyl. Forget smearing your chrome with Vaseline or spray grease to protect it in bad weather! Nyalic gives long-term protection, leaves bright and bare metal looking freshly polished (brass and copper won’t re-tarnish) and prevents oxidation and corrosion. Brake dust doesn’t stick to Nyalic-coated metals and it is heat resistant to 177°C. It can be used under the bonnet, to seal electrical connections, wiring harnesses, rubber hoses and plastic parts, and the results can be maintained indefinitely. A crystal clear polymer resin, Nyalic will prevent rusting, staining, pitting all the nasties that plague metal on automotives. Coat your wheels, exhausts and other metal parts with Nyalic and save yourself hours of cleaning and polishing. If you want an instant shine on metal parts, apply Scholl Concepts SW10. 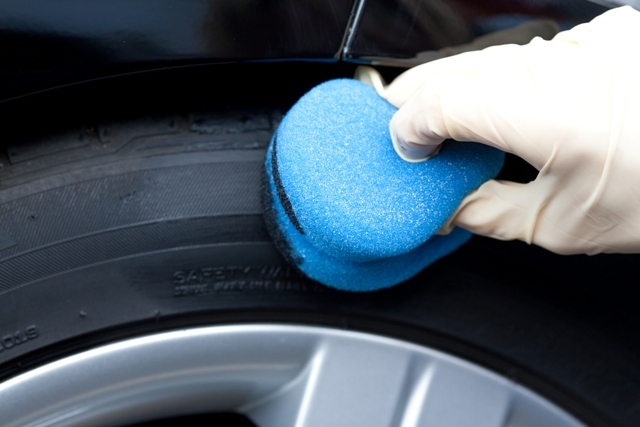 Avoid dressings that will wash off in the rain and ruin your nice clean paintwork! There are many available that will re-colour trim and bumpers temporarily, such as Scholl Concepts Blue. If you are looking for a long-term fix try Nyalic. This crystal clear coating will restore any colour ABS plastic back to its original glory and prevents re-fading. An incredibly thin layer is all that’s needed, but all residues of previous used dressings must be removed first and it takes 24 hours to fully harden. After a good vacuum inside your car, you can spot clean your carpets with SP Wonderspray or a similar cleaner fit for purpose such as Angelwax's Carpet & Upholstery Cleaner (always try new products on a small, inconspicuous test area first). Agitate with a small nail or upholstery brush and wipe up residue with a microfibre. 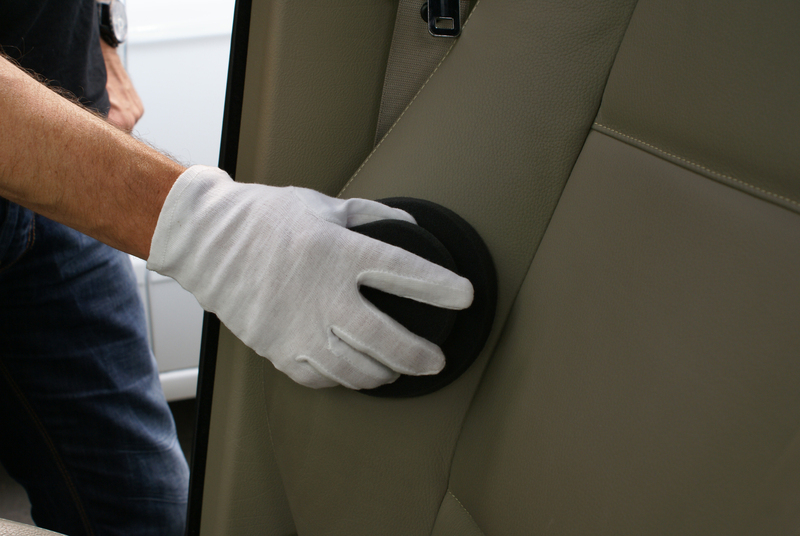 Remove loose debris and gently prize seams open when vacuuming leather seats. Use your preferred leather cleaner and don’t forget to condition regularly. If your leather looks greasy you could be over-conditioning. If your leather seats suffer from discolouration due to dye transfer from trousers, spray on SP Wonderspray and gently work the area with a microfibre cloth (don’t scrub). Leather seats that have been recolonised or recoloured tend not to be as colourfast, so take care when cleaning. Silicone-free interior dressings that leave a natural or satin finish are best. Spray-on PureX Interior or Scholl Concepts Purple, for example, have a deep cleaning action but leave an anti-static, non greasy, glare-free finish on a wide range of interior surfaces. If you prefer a wipe-on gel that won't splash on interior windscreens when cleaning your dash, opt for Angelwax's AnGel Plastic & Interior Dressing. Use a good glass cleaner with a quality microfibre to get streak-free results. Disposable cloths, wipes or paper towels can also work well. Mist the area, work the product over the surface and flip the towel over to buff. There are a wide variety of specialist products available for cleaning, treating and protecting soft tops. Avoid getting the reproofing products on your paintwork: mask off susceptible areas and if possible open up the roof away from bodywork. We recommend Scholl Concepts SPAM or Bubble, or Wonderspray, for cleaning and Angelwax Shield for reproofing.